One Steamy Relationship, Coming Up! This is the quote [of mine] that Hubster, the one and only Peppermeister, used for his latest blog post*. The other night he made guacamole and salsa containing twelve Serrano peppers and one lethal jalapeno. 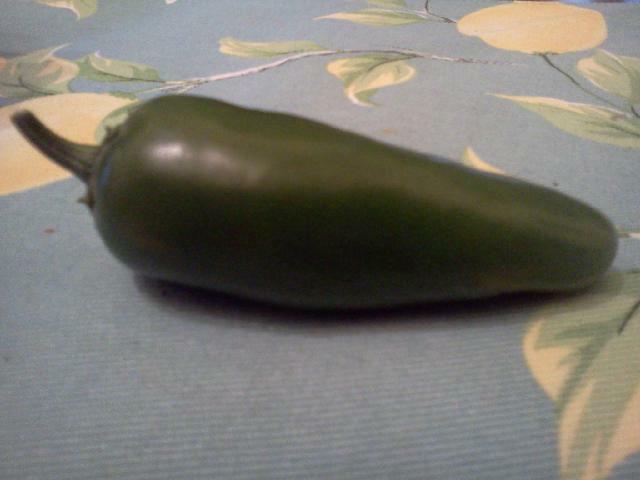 I don’t know where these jalepenos come from (oh, who am I kidding? I’m married to the Peppermeister – they’re called Biker Billy jalapenos and the plant came from Cross Country Nurseries), but let me assure you they throw the whole Scoville scale off. They’re the hottest mother loving thing I’ve ever eaten. One seedless, spineless, centimeter-long sliver has me researching ways to exact my revenge chugging milk. I’m tentatively willing to let this one slide, because otherwise I’ll get stuck on dinner duty. My husband is a great cook, and takes no small amount of guilty pleasure pride in measuring his peppers, insisting I take daily tours of his organic pepper garden, and trolling pepper-related websites. He’s helped me build an impressive heat tolerance, but on Sunday night, he went too far. If I suddenly stop blogging, please alert the Spice Authorities. I’m pretty sure they can still be reached at 1-800-DIE-WIFE. *If it seems like I’m shamelessly promoting my spouse’s new-ish blog even though he just tried to snuff me, I’m sorry. On a totally unrelated note, I have really high hopes for my Christmas present this year.